I’ve been too busy working to blog about the house going up but there has been a lot of excitement around here every day! We’ve got walls and it’s starting to show us what it’s going to look like and how we can place furniture in our rooms! I thought it was exciting when I came home and the first floor was all closed in with the plywood. I could finally see the size of the windows and where the front door would be. Before this I thought it was going to be small. Ned even went and measured the slab one night because I was so worried that we’d built it too small. It was spot on! The door you can see is the one that will lead to the screened porch. The two smaller windows is the kitchen and the large window is the dining room. All of the rooms are in the same place as in the old house. It’s basically the same downstairs floor plan it’s just more open! And then one day I came home and climbed up a ladder to stand on what will be our second floor. 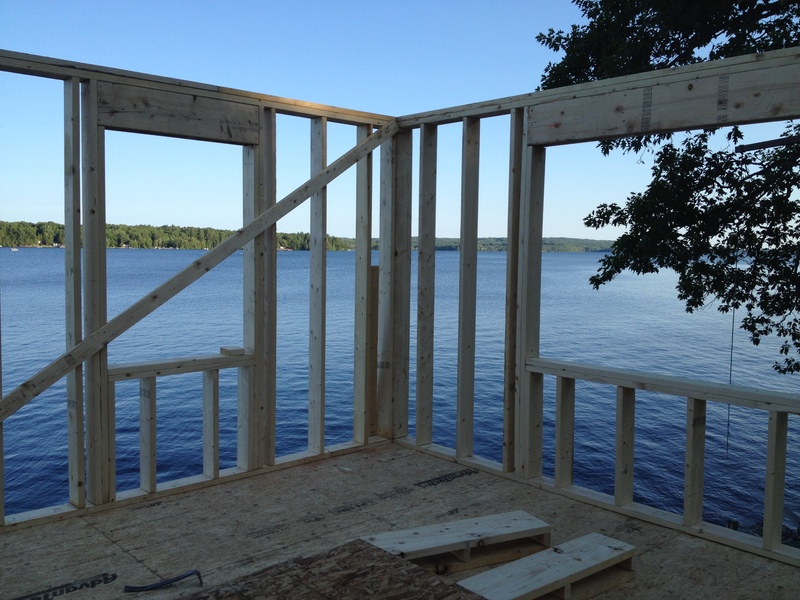 With some of the exterior walls up, it’s going to be a phenomenal view of the lake through the big windows on the front of the house (and the sides, too!) We have to have a bunch of bedrooms available because we want our family to come visit (and friends, too.) 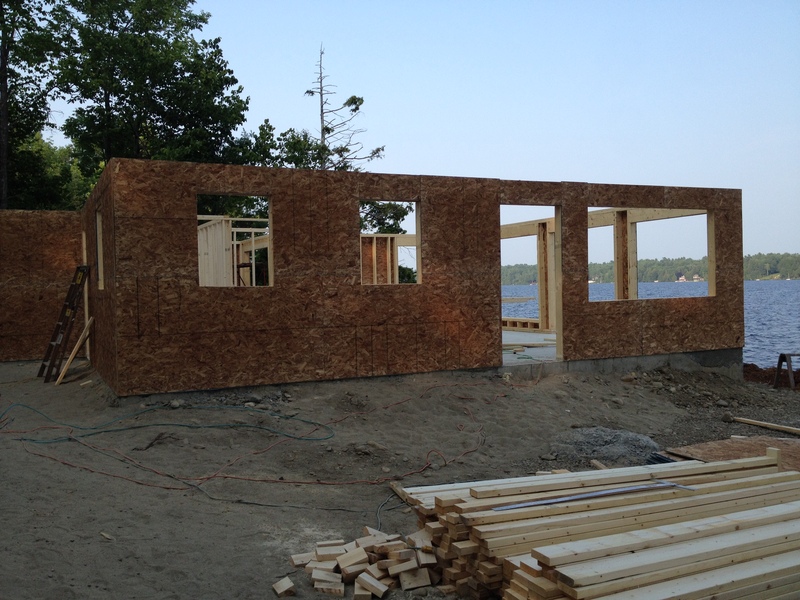 Each room on the second floor will be able to sleep our friends and family. Only one will be a dedicated guest room. The other will be my studio and the third will be Ned’s TV room. Although we discussed moving the TV up to the third floor and expanding my studio when we saw the size of the third floor former attic space. 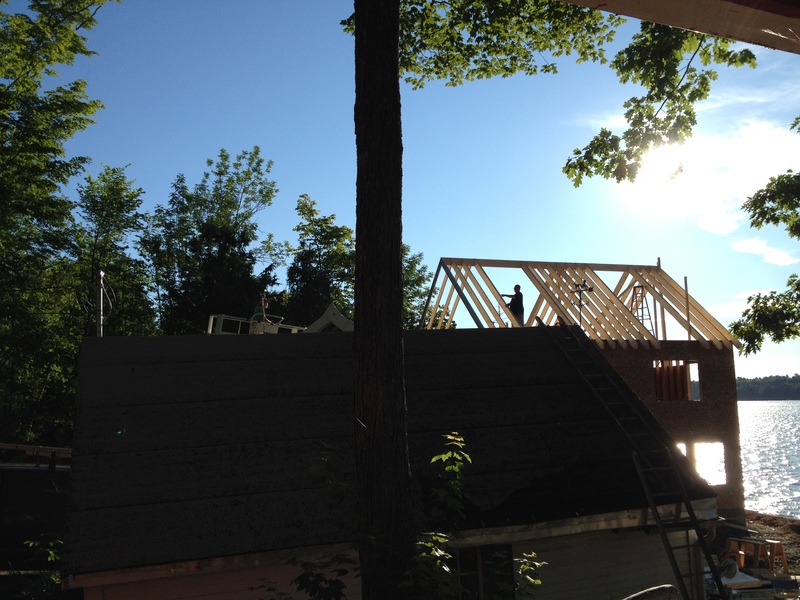 The best day of all was when I saw the roof of the house rising above the woodshed roof again. There has been a hole there since we took the old house down and nothing felt right. But it’s coming back and all is right with the world. I got a ride with our contractor in the lift that we’ve rented to get the wood up to the roof without having to carry it. What a blast! The view of the house from the air is amazing and the view of the lake from the top of the house is phenomenal. Ned’s office space on the third floor is going to be the best view in the house. Pinch me! We get to live here! This entry was posted in Building a Home, Uncategorized and tagged a special place, home, home building, lake house, Living in Maine, Maine, Messalonskee, we get to live here on July 27, 2015 by lindarockwell3.